Keeping a zero waste program going requires coordination and support that can be challenging for schools, especially when there isn’t more than one champion. Lincoln Elementary School in Oak Park District 97 started commercial composting and recycling in the lunchroom in the 2013-2014 school year, but for various reasons, the program didn’t stick. After years of hoping to get it back on track and seeing it work successfully at other schools, Lincoln parent Carolyn Cullen convinced the school administration to give it another try. This time around, the zero waste program was launched with broad support– the administration, the lead custodian, and multiple parent volunteers– all were on board and eager to see Lincoln succeed. With guidance from Seven Generations Ahead’s (SGA) Zero Waste Schools Program, Lincoln relaunched is zero waste lunchroom program on January 29, 2019. 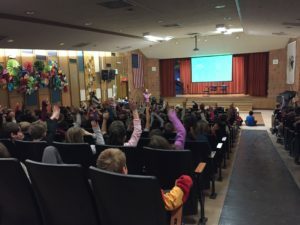 That morning, all of Lincoln’s 687 students and their teachers attended an assembly presentation delivered by SGA to learn about the How and Why of going zero waste. Together with parent volunteers, SGA provided onsite support during the launch day and conducted a waste audit to measure the school’s impact. Lincoln students are doing a wonderful job of sorting and, thanks to Cullen’s persistence, Lincoln now has a Green Team with a dedicated group of parent volunteers who help monitor the sorting stations. As these before and after photos show, Lincoln’s waste reduction impact is significant. 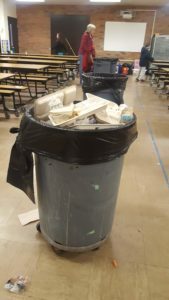 Before program launch, there were 8 trash bins spread throughout the lunchroom, and the custodian pulled them twice each day, for a total of 16 bags of trash per day. Lincoln now has 2 sorting stations with bins for liquids, recycling, landfill trash, commercial compost, and stacking compostable lunch trays. With the program, Lincoln reduced its trash to just 2 small bags of landfill trash weighing a total of 16 lbs (11% of the total 149 lbs of materials generated that day). Learn more about the waste audit results and relaunch here. What’s even more significant about this relaunch is that Lincoln’s sorting station includes a recycling bin. At the end of the 2017-2018 school year, Waste Management, the waste and recycling hauler for the district and the Village of Oak, wavered on whether or not they would accept cartons, and D97 started incurring contamination charges from Waste Management. In an effort to avoid extra charges, the district made the decision to stop milk carton recycling at all schools. 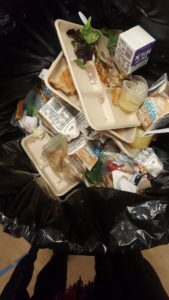 This was a significant step backwards in lunchrooms across the district; many schools pulled their recycling bins from their lunchroom sorting stations altogether since cartons were the main item they captured. 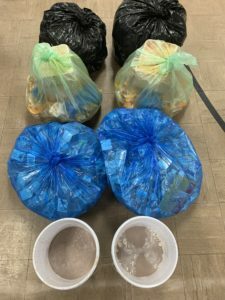 Prior to this school year, all of the district’s nine other schools were in the routine of recycling milk cartons and other recyclables in their lunchrooms. When recycling was in place, which it had been for years, D97 schools typically diverted an average of two large bags of lunchroom recyclables from landfills per school per day (note the volume of the two blue bags in the photo above). Just as this school year was starting, Waste Management opted to accept both gable-top cartons (such as milk cartons) and aseptic cartons (such as juice boxes and broth boxes), from both the Village of Oak Park and D97. The Carton Council, a nation-wide organization representing carton manufacturers, confirms that despite the recent upheaval the recycling industry globally, there is a strong domestic market for carton recycling, and milk carton recycling is a viable option. D97, however, remains wary of contamination charges and has not reinstated milk carton recycling at any of its schools– except now at Lincoln. 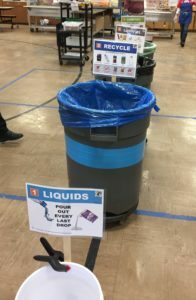 Since Lincoln students and staff were already being provided education and guidance for using the new sorting stations, the Lincoln relaunch presented an opportunity to give carton recycling another try. So far, Lincoln has been doing a great job and has not incurred any contamination fees. Hopes are high that Lincoln’s leadership will help the rest of the district restart recycling. If their pioneering efforts can get recycling back on track district-wide, it will help the Village meet its sustainability goals around waste– a 1% reduction annually– as outlined in the PlanItGreen Sustainability Plan for Oak Park and River Forest.